A Korean American learns English and ham radio together. We all remember the glow of satisfaction from passing our first license exam and the thrill of our first contact. Many of us have tried to give back some of that by coaching one or more newcomers into the hobby. We have felt an inner satisfaction at seeing them make it all the way, especially if there has been an impediment of one kind or another to overcome. Such was the case with Ung Chang. I was still quite new to the neighborhood when he walked up to me and introduced himself. After that he would catch up with me each day whenever I stepped outside of the house. We would walk together and he’d show me around the neighborhood, chatting away in slightly broken English. We had only one thing in common: Each of us was an elderly man who needed a friend. I was 70; he was 77. He wanted to write down his autobiography and being a writer of a sort, I helped him out with that. Doing so revealed to me that, beneath his seeming simplicity lay a remarkable individual. Ung started out as a little kid slogging away beside his father and brothers in a South Korean rice paddy. What little education he got in the then Japanese-dominated land was interrupted from time to time as the need for his help in the rice paddy sometimes superseded his need to continue schooling. When the war ended and the Japanese rulers left, he had his first encounter with American GIs. He became fascinated with their language and resolved to learn it. Having been required to become proficient in Japanese (school children had not been allowed to speak Korean in the Japanese-run schools) he managed to get hold of a Japanese-to-English dictionary and taught himself, one word at a time. Meanwhile, North Korea invaded the South and the Korean War began. He fled with his family and spent a month on the road as a refugee. 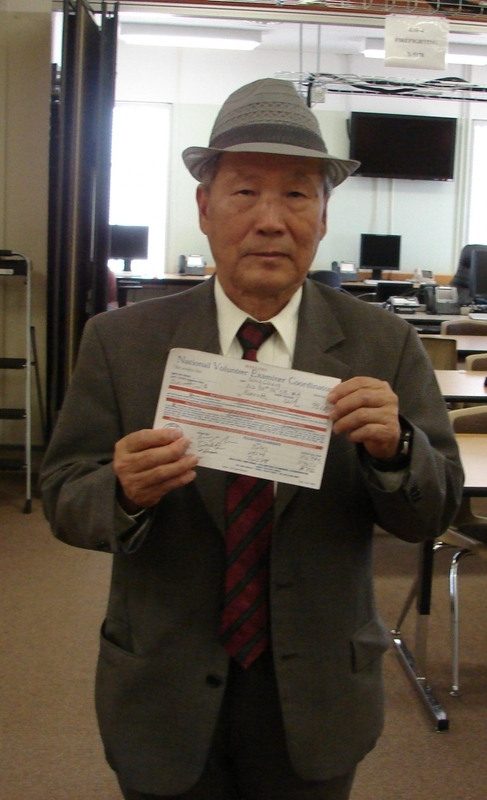 Joining the Korean army, he was selected to be a spy against the North and almost wound up getting shot by his boss. A dirty trick by an American civilian landed him in the Koje Island prison camp, a POW of the very side he had wanted to serve. There he languished for the duration of the war, still trying to teach himself English. When hostilities ended he went home to find his mother close to starvation and was drafted back into the Korean army. He completed his obligation, coming out as a First Lieutenant. Then he got a job as a fireman on the US base near Seoul. After 40 years of service, and saving a number of lives, he had earned a chance to come to this country. I tell you all this so you will see that he is a highly intelligent individual who had nothing comparable to the education you and I received and have taken for granted. Now he wanted to get a ham radio license. He had a limited English vocabulary and almost no background whatever in the basic foundations of general science upon which most of us have built our understanding of radio. When I tried contacting the Korean Amateur Radio League in search of basic textbooks written in his own language, he would have none of that. He wanted to do it in English. I got him a W5YI study guide and for three agonizing years listened to him struggle with a multitude of technical terms and bits of jargon that were entirely new to him — and a challenge for me to explain. He would read the questions and answers over and over, trying to master the pronunciation and to understand the meaning. It was an uphill fight but he never even thought of giving up. Like the Energizer Bunny, he kept going and going. It took time, but I could see the glimmer of understanding begin to creep through. Along came Ham University. I wanted to see if he was really catching on, so I began having him take practice exams. He took the first two exams and surprised me by coming within one or two answers of passing. After that he never got more than three wrong answers in the next 14 exams. He was ready. He enrolled in a licensing course put on by one of the local clubs and that’s all there is to write about. He passed the exam with flying colors. Being 80, he was the oldest in the group; the youngest was 12. All the guys on the local 10 meter net began checking the FCC database and when his name appeared there with the call KF7EEX, well, you can bet there was one proud new ham. So, he’s arrived at the door to ham radio, but his trip isn’t over; it’s only just begun. Now we’re focusing on familiarizing him with the equipment and operating techniques. He tagged along with me to observe and learn when I helped the Snohomish County (Washington state) Department of Emergency Management in their mobile communications van. He has gone on to pass his General with flying colors but was that enough? No. We’re now working on his Extra class license. I’ve no doubt he’s going to pass. Bill Hood, W2FEZ, an ARRL member, was first licensed in 1951 as WN1USM, thanks to the dedication of a kindly old man at the Bunker Hill Boys’ Club in Boston. His call sign was changed to W2FEZ in 1969 when he moved to New York State. He has authored several books for electronic hobbyists, through TBA Books. After his wife passed away in 2005, he relocated to Washington State where he now lives with his son. Bill recently published Ung’s life story under the title The Winding Road, available through www.llumina.com. Bill can be contacted at 227 97th St SE, Everett, WA 98208-3261.